One of the biggest challenges of identifying a Cackling Goose is just finding one, especially in the east where the species is rare and occurs mostly as single birds (of the relatively large and pale Richardson’s subspecies) among big flocks of Canadas. 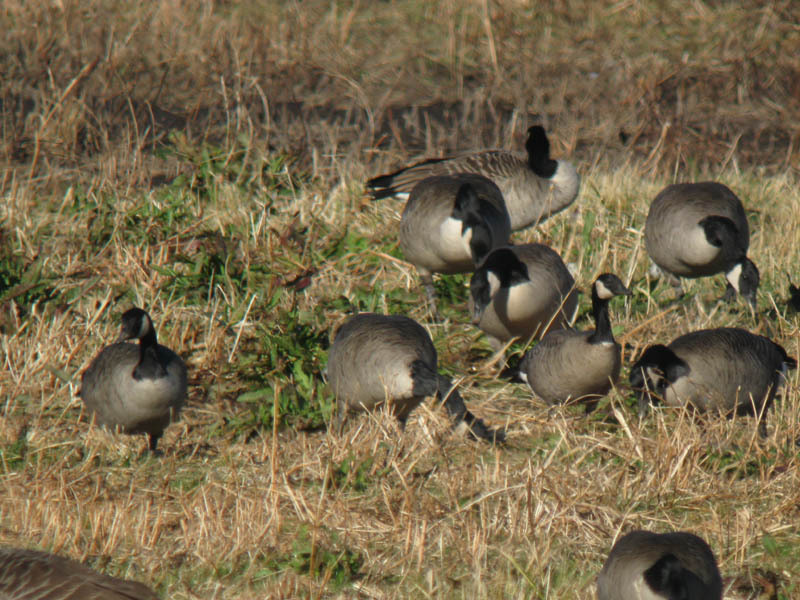 The photos below show one Richardson’s Cackling Goose among Canadas. See if you can pick it out in each photo, then read below for tips on what to look for. Canada and Cackling Geese, Acton, MA. 14 November 2012. Photo by David Sibley. When looking for Cackling Goose among Canadas I find that it’s best to focus on the body size of the birds and just scan for one that looks smaller or less bulky. You’re looking for a bird about two-thirds the size of the standard Canada Goose. It’s tempting to scan the flock looking for a bird with a small bill, since that is the most reliable distinguishing feature emphasized in all of the field guides, but the differences are hard to see, and bills are often hidden, and therefore this is not a very good way to find a Cackling Goose. Unless you’re very close to the geese it’s better to ignore bill size until you’ve located a good candidate based on other features. Once you’ve found a bird that looks smaller, check the overall color. A typical Richardson’s Cackling Goose is slightly darker and warmer brown on the breast, and slightly more grayish or silvery on the back. If you scan through any big flock of Canadas you can find birds that match each of these features, and plumage color by itself is almost useless for picking out a Cackling Goose, but any bird with smaller size and these plumage colors is likely to be a Cackling. None of that is absolutely diagnostic for Cackling, but it will tell you that you’re on the right track and then you can work on studying the bill. On some individuals (like the one shown above) the warm brown color of the breast blends to darker and more rusty at the upper edge just below the black neck, and this darker breast color helps to set off a small white collar (also only on some individuals). A similar white collar is only rarely shown by Canada Goose. If you’ve actually found a small goose that looks slightly more golden on the breast and grayer on the back, then it’s time to confirm the identification by studying bill size. Judging size is harder than it sounds, since the geese are usually moving around, and standing at varying angles on uneven ground. A bird facing away and standing in a furrow will always look smaller than a bird in profile standing on a ridge. In addition, males average larger than females, and size is quite variable overall. You will have to watch a goose move around for at least a few seconds while comparing it directly to other geese to be sure you’re getting an accurate impression of size, and you can expect a lot of “false alarms” of birds that look small at first and then transform into more normal size. If it still looks small from several angles then it is worth closer study. It’s a little easier to judge the size of birds that are swimming, since they are all on the same level. The best opportunity to judge size is when something alarms the geese and they are all in alert posture. Scan quickly then for smaller birds. When comparing sizes within a flock, keep in mind that geese (unlike most birds) often stay together as family groups through the fall and winter. If you find a bird that really looks small, but a few of the geese around it look about the same size, it is worth making some extra comparisons to see if that whole group is smaller than the average of the flock. I haven’t mentioned neck length above because I don’t think it’s very useful as a distinguishing feature. The neck length of an individual bird can change dramatically depending on stance and alertness. 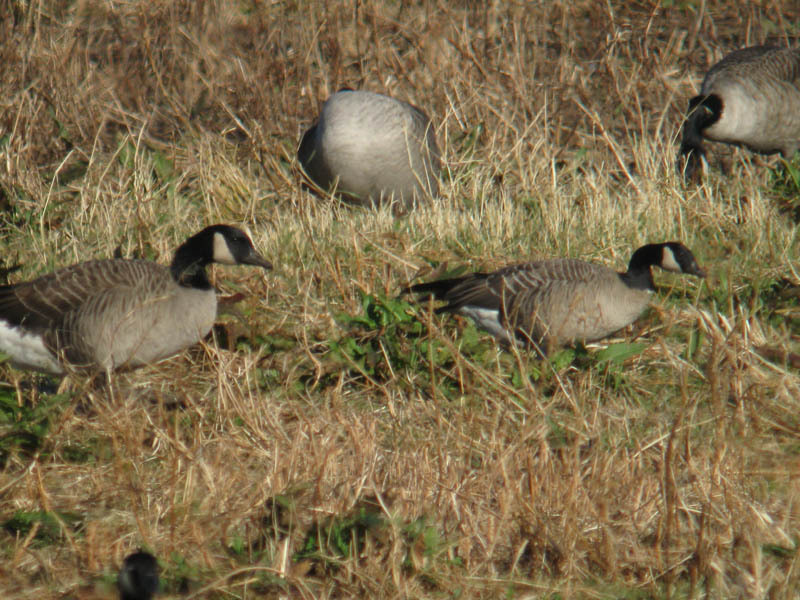 It is true that Cackling Geese average shorter-necked than Canada, but there is just too much variation, and too much overlap, to recommend this as a field mark. When there is less variation in neck posture – in flight, in alert posture, or when grazing with head down – neck length is more reliable and worth studying, but in most situations it’s just too variable. 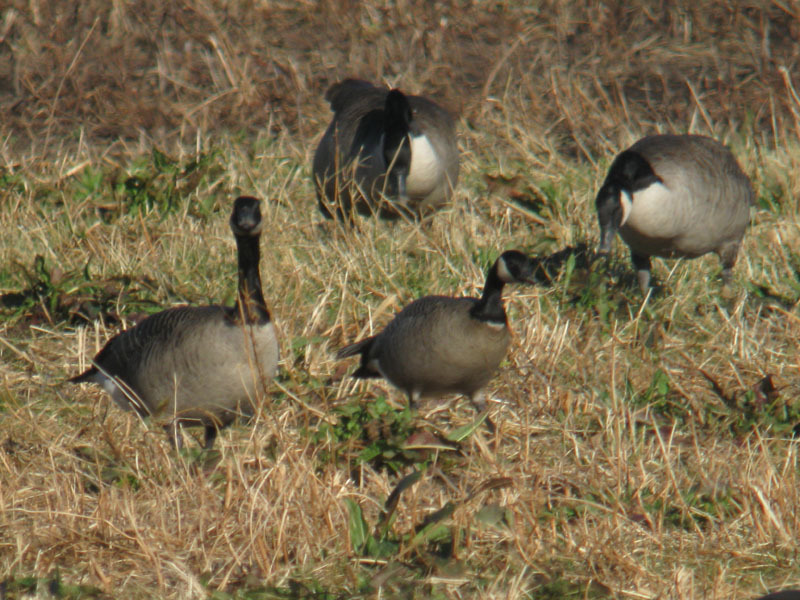 In the first photo the Cackling Goose is the bird in the left foreground with head down; in photo 2 right foreground; in photo 3 second from right foreground with head up; in photo 4 right foreground. All of the other geese are Canadas. I picked the correct bird from every picture, so what I want to say is “What a great test!”. To be honest I can’t take much joy in it because I knew going in there was one and only one in each picture. So far I haven’t found a Canada flock with any indication ahead of time about how many cackling are concealed therein. If you’d thrown in one more picture and added the challenge of picking which one had none… maybe next time? That’s a great idea, I will try to find the time to add another photo or two. At least in the Northeast, I find that scanning flocks for frosty-backed individuals is a very effective way to key in on candidate Richardson’s Cackling Geese. Then, in addition to overall size and bill and neck proportions, I think the body profile of RIGOs is very distinctive–they are spindle-shaped, with a much flatter back and relatively longer wingtips than our typical Canada Geese. On a RIGO, the highest point on the back occurs relatively far forward, and the profile then drops away in a straight (or even slightly concave) line through the projecting wingtips. Canadas typically show an evenly domed profile to the back. Hi Shai. Thanks very much for sharing your tips. 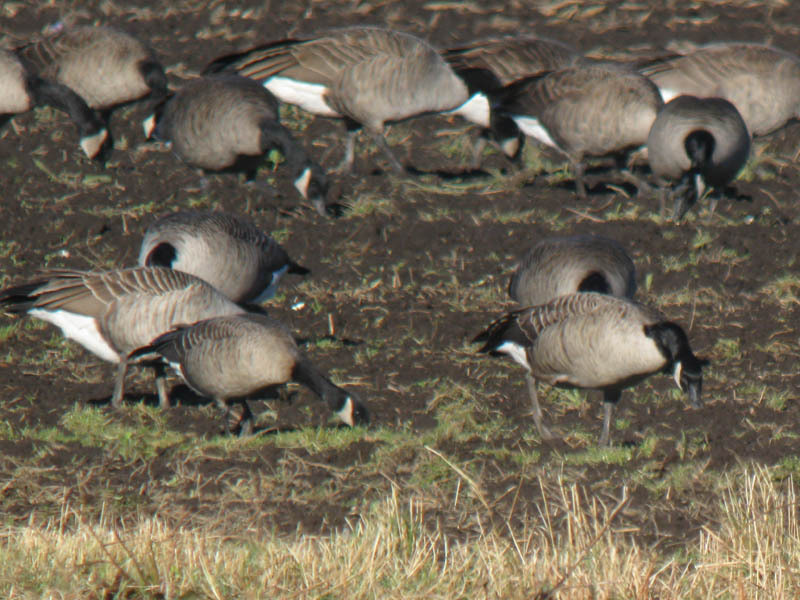 Whenever I compare the back color of a Cackling Goose around the flock it seems like I always find a few Canadas that match, but as a way to pick out likely candidates, and then check those for size, I see your point. The backs are always visible, and as long as the lighting is decent it’s probably easier to assess back color than size on a quick scan. The difference in back profile is something I had never noticed, but I can see it in the last photo above. I will definitely watch for that. I wonder if it could be helpful for separating Lesser Canada from Richardson’s? I’m very curious about that “Cackling Goose.” Yes, it’s small, but the underparts coloration and the apparent head and bill shapes are all atypical (to say the least) of Richardson’s Cackling Goose, the most likely form to occur in New England. In fact, my first thought was that it was an Aleutian Cackling Goose, which would make for an incredible record that far east. Since I don’t know Aleutian at all well (I’ve seen just one), I asked Steve Mlodinow for his thoughts. While he wasn’t sure that he agreed with my assessment of head (rounded) and bill (seemingly intermediate between Richardson’s Cackling and Lesser Canada) shapes due to distance in the photos, he thought that the beast looked like an Aleutian. Interestingly, this fall/early winter, has seen a very obvious hit of Aleutians farther east than is typical for their usual overwater-Aleutians-to-Oregon/Californa migration route (large number of birds in w. Washington and other odd places). Also, Steve found one in Colorado which, pending acceptance by the CBRC, would account for the state’s first. I strongly encourage closer and more-thorough examination of the Acton bird.